We picked up Shivers! : The Pirate Who’s Afraid of Everything after reading this fabulous list of books for tweens posted on Brightly. I read the list above and put every single one of the titles on reserve at our library for our Pioneer Girl, but when I picked this one up I wondered if Pioneer Boy might be interested in it too. He does love a good read-aloud chapter book, so the first night we invited Miss Pickle in for his nightly reading time and tried it out it. It was an immediate hit with both of them. Shivers is a scaredy-pirate who had the misfortune of being born into a very brave pirate family. He was named for the very piratey saying “shiver me timbers,” but unfortunately his shivers are more of the worried sort. His mother, father, and Brave Brother Brock are all known in pirate circles for their courageous acts of villainy on the high seas. Shivers, however, lives on a ship called the Land Lady, which is docked in the middle of the beach in New Jersey, and his greatest adventure is the battle with the alarm clock that he relives each and every morning — until one day when he receives a message by carrier pigeon telling him that his brave family members have all been taken hostage and that he is the only one who can save the day. Even a scaredy-pirate can’t ignore this call for help, so Shivers sets off to rescue his family. After a little more than two weeks of a chapter a night, we finished Shivers this evening. 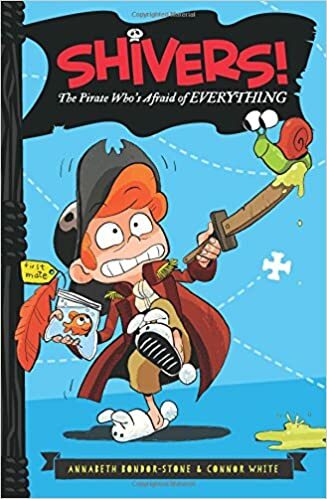 I asked each of the big kids what they liked best about it, and they named particular scenes of piratey grossness that I will leave you to discover for yourself. My favorite part of the book, though, was Margo. We meet Margo in chapter two, when she is the only one willing to help Shivers with his quest. Margo has always wanted to save the day, but being a regular police officer’s daughter, she hasn’t lead the life of a pirate. She is only too happy to take the clues Shivers receives and lead the way to adventure. As Shivers gives Margo the adventure she’s been craving, she lends him a little of the courage he’s been seeking. Along the way they develop a sweet friendship as they rescue each other from mishaps and one-eyed pirates and giant squids. I was so glad to get to know Shivers and Margo and to have such brave, kind characters in our lives for a couple of weeks. I hope we’ll meet them again in future books. For now, this was a fun, silly adventure the whole family could enjoy, with a message of kindness and courage at its core and a strong female character to make it even more appealing. Is it weird that I want to read a kid’s book being a teenager? Because this book sounds fun. I’m a grown up mom and I read it! You’re never too old for a fun book, I say. 🙂 Have at it, and let us know what you think! I’m looking for new chapter books to read with my kids – would you share a couple of your favorites? My Pioneer Girl is 9, little brother is 5, and the “baby” just turned 4. The baby is still a picture book girl, but she ADORES reading. I often find her making up stories to go with the pictures in whatever book she’s found. PRECIOUS! That sounds like such a fun book! I’ll have to pick it up. I can’t wait until my littles are old enough to enjoy reading these books with me. 🙂 Thanks for the recommendation! Let us know how you like it when you get to it. My kids are hoping it becomes a series!